Flying and dreams coming true! | Come believe with me. Flying and dreams coming true! I got to fly a plane! I’m in a great season of being saturated in love, acceptance, and championing. I waited a long time for this: 32 years. Now, I have the man of my dreams, Neel. Everything isn’t perfect, and the growth is whoa challenging and yikes maturing, but this time is so wonderful and precious. God gave me my perfect match – not a person who is perfect, but a person who is perfectly matched to me. I am in awe. One sweet glimpse of that is the flight we took in November. Neel surprised me with the opportunity to fly a plane as a birthday gift. He took my higher, gave me new perspective, provided the adventure my heart craves. His actions were poignantly like the way God loves me: pure, sincere, with my dreams in mind. Last night, my pastor, Bill Johnson, asserted that one must keep one’s hunger for God in balance with one’s thankfulness. When you become more hungry than thankful, dissatisfaction and eventually disillusionment establishes itself. When you are more thankful than hungry you move toward stagnation, because you are more oriented toward the past than the present and the future. This was so good for me – particularly the hunger over thankfulness part. I’ve been more hungry than thankful lately, wrestling with the deep dreams of my heart as I wait for alignment to come. God has a better way than my turmoil. He has peace and momentum. Mmmm… so, I am amping up my thankfulness. 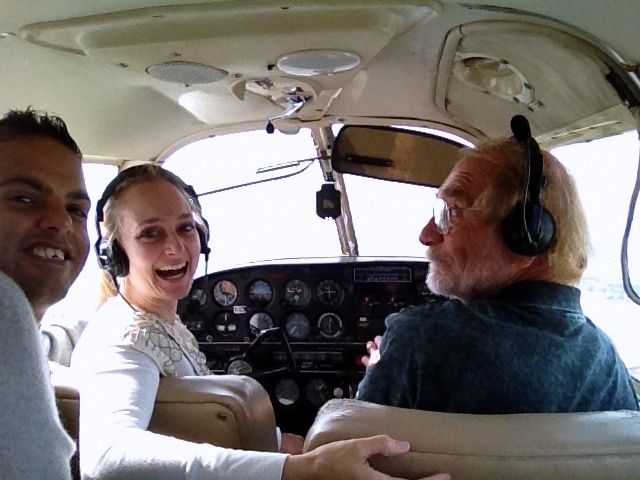 And, wow, I am really thankful for the experience of flying a plane. Hopefully, that is inspiring, and gives fresh wind to your own journey between the already and the not yet. I release the spirit of upgrade to you through this blog post. May today move you forward profoundly. Wow, I’ve never thought about it that way. I’ve definitely let my hunger pass my thankfulness lately.. Thanks for posting this. You’re welcome! I’m glad it’s brought revelation. You’re welcome. THANKS for dropping in.